Here at Rotoballer, it’s never too early for a football mock draft! Free agency and the NFL draft will change the composition of the league, but the accompanying hype can skew how we feel about players and lead to overdrafting mistakes (can anyone say Terrelle Pryor?). 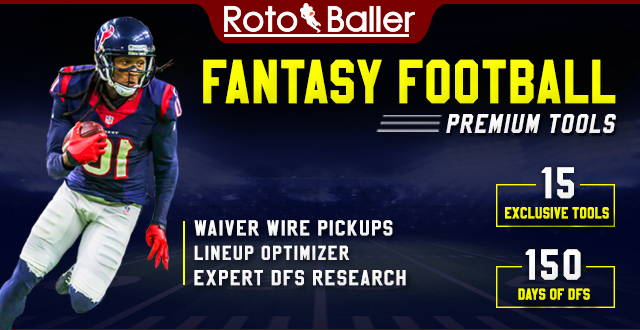 Dynasty football never ends, so we’re here to provide you with the insight you crave. This league’s starting lineup is 1QB, 2RB, 3WR, 1TE, 1FLEX. All 20 rounds will be dissected and analyzed for the likes of reaches, steals and solid picks. Hopefully by the end you’ll walk away with a great understanding of the state of the league entering free agency and the draft. You didn’t come here for an introduction, so let’s jump right into the draft with the first round results and analysis. 1.01 Steve Halupka Odell Beckham Jr.
Odell Beckham Jr. or OBJ as I’ll call him from here on out, is the near-unanimous first overall pick in any dynasty startup with its stripes. Beckham is possibly the most electrifying playmaker in the NFL right now and has been as consistent as any player in the league. Every year where Beckham has played during the regular season, he has finished in the top-five in points scored. All of this with an Eli Manning who’s been past his prime for some time now. With Brandon Marshall nearly out of the picture and continued uncertainty at the running back position, OBJ stands to continue to soak up the same number of targets as he’s enjoyed over the last number of years. For those who are worried about Shepard, or Engram eating into his target share, don’t be. If anything, their presence will open up opportunities for OBJ to make teams pay by not double teaming him every play. David Johnson was hoping to become a member of the illustrious 1000-1000 club last year before his season was cut short with a lingering wrist injury. In 2016 David Johnson amassed over 2,000 yards from scrimmage with an aging Cardinals’ team whose offensive line wasn’t substantially better than it was in 2017. DJ is still rather young at 26 and is likely to continue to perform at a top level for another three years, especially since he didn’t face the same wear and tear as a player of his age since he sat out the 2017 season. The Cardinals' offense will continue to funnel through Johnson, especially if Arizona is starting a rookie at QB in 2018. I think the youth and upside of the following players would have propelled them above DJ, but you would get no complaints from me if you took DJ at 1.02. DeAndre Hopkins put his doubters to bed with his second breakout season in 2017. Hopkins was the top-scoring fantasy wide receiver in nearly all scoring systems last year. Hopkins combines phenomenal hands with an extremely aggressive route running style that allows him to use his large frame and athletic profile to beat nearly any kind of defensive back. This dependability turned into over 170 targets last year. Entering his age 26 season, Nuk is firmly in his prime and stands to deliver for your team for years to come. Considering what Deshaun Watson showed the world last year, I’d be happy to take Hopkins at 1.02, so even 1.03 is a value. Todd Gurley was a top-10 draft pick by the Rams and he has most certainly lived up to the billing. He was the fantasy MVP in 2017 and likely won you your league if you had him. A young player on a young team, Gurley doesn’t seem to be slowing down any time soon. Gurley outscored Bell and all other running backs by a significant margin last year. Even with a severe regression to mean, Gurley could stand at the center of any fantasy team for at least the next three to four years. It's hard to argue taking him at this point. No one plays like Le’veon. His patience is slowly changing the way the running back position is played. Players like Joe Mixon and Saquon Barkley have attempted to copy his play style, but it has yet to be seen if anyone can measure up. Bell catches more balls than any other running back and is a killer in PPR. Though his sheer usage should have some fantasy players worried. Bell works well in this general range. Concerns of holdouts and contract situations shouldn't muddle his long-term value. If you want consistency, you’re getting it with Antonio Brown. You have to go all the way back to the 2013 season to find a time that Brown wasn’t a top-three fantasy producer (he was ranked seventh that year). As long as Ben Roethlisberger is on the field, Brown produces. His age (30 when the season starts), and Ben’s impending retirement give many players pause, however. His talent can’t be denied, but his future prospects leave me and many others worried. Zeke Elliott is in as good of a position to succeed as anyone in the NFL, and if he can get past his off-the-field issues, he can take his place as one of the best three backs in the league. Zeke is a prototypical three-down back, and his production matches it. Zeke is the youngest RB on the list thus far, and as long as he doesn’t get thrown out of the league he’ll be the centerpiece of your team going forward. Quintorris Lopez “Julio” Jones is the most physically-gifted receiver in the NFL today. He’s prone to 300+ yard receiving games at least once a year. Julio doesn’t score a lot of touchdowns, but he makes up for it with his sheer dominance at the catch point and the ability to take over games. Another year in Steve Sarkisian’s system will hopefully yield better results for Julio, who’s coming off a bit of a down year with 1,444 yards but only three touchdowns. Kareem Hunt burst onto the scene last year, with his league-leading 1,327 rushing yards. Hunt was the overall RB3 last year and has seemed to take the lead-back role in KC. Reid likes to play multiple running backs, but it doesn’t seem that a perpetually-injured Spencer Ware poses much of a threat to the younger and more talented Hunt. With Patrick Mahomes starting at QB in 2018, there’s a high chance that the Chiefs will lean on Hunt for 2018 and beyond. It's shocking that Evans fell this far in a dynasty format. The number one overall wide receiver in 2016 had a hard time in 2017, only catching 71 balls for just over 1,000 yards. If this constitutes Evans’ worst year, that’s quite good. Evans is likely in for a positive regression in 2018, and I consider him a steal at 1.10. Michael Thomas was the Saints’ receiving game outside of their running backs last year. Brees targeted Thomas nearly 150 times in 2017 alone and had a superb 69.7% catch rate. Brees trusts Thomas and will be looking his way as long as he’s in town. Thomas is going to be 25 this year and stands to be a cornerstone of any offense he plays for throughout his career. Melvin Gordon is coming off a top-five fantasy year. Gordon scored 12 total touchdowns in 2017 and amassed nearly 1,600 scrimmage yards. Gordon did all of this while still averaging under four yards a carry. This means that the Chargers’ coaching staff trusts him. Even if Gordon doesn’t command the same snap percentage in coming seasons, he’s still going to be a solid starter that any team would be happy to rely on. Offensive Rookie of the Year Alvin Kamara would be taken with the next pick, although Mark chose Melvin Gordon over the likes of Fournette, Barkley, Cook, Howard and Freeman. The first round is considered sacred ground for bell-cow backs and top-end WR1s, so Gordon feels a bit out of place. Nearing the end of the season, Gordon saw his snap share eaten into by the likes of Austin Ekeler. Ekeler, along with pass-catching back Branden Oliver, stand to threaten Gordon’s vice-grip on his bell-cow status in 2018. A top-end back can only maintain below a 4.0 yards per carry average for so long before the coaching staff looks for alternatives that can help diversify a stagnant offense. By no means is this a bad pick though, as Gordon has been a top-10 fantasy back for the last two years running. Fantasy Dogma says that wide receivers are more valuable due to their longevity, but there’s nothing wrong starting out the draft by grabbing top-end running back talent. Mike Evans had a harsh 2017 season, there’s no way to get around it. Evans dropped from the top rated wide receiver in the NFL in 2016, to the 17th in 2017. This performance placed him between Demaryius Thomas and Robby Anderson. This looks bleak, but in reality, Evans was thrown the ball nearly 40 fewer times in 2017, but still increased his average yards per catch compared to the 2016 season. Much of this drop-off in targets was likely due to Winston being injured for a number of games. Regardless, with this blemish on his resume, it would make sense that he would drop in start-ups, but it was only last year when Evans was being drafted second overall. This was for good reason, as Evans is entering his age 25 season and is paired with one of the best young gunslingers in the NFL. Even if the Buccaneers don’t re-sign Evans, his play-making ability will command such an enormous free agent contract, that any team that picks him up will be force feeding him the ball game in and game out. I believe that 2017 was Evans’ floor, and we’re in for a big positive-regression to the mean in 2018 and with it his resumption of top three dynasty start-up value.